ADDING an Eastern flourish to the traditional festive season, Ichi Sushi and Sashimi Bar at Park Plaza Westminster Bridge London has introduced a limited edition Christmas Sushi sharing platter. 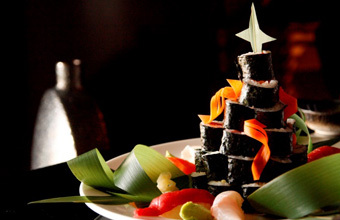 Available from December 1 - 30 2013, the platter includes a set selection of Uramaki and Hosomaki rolls and Nigiri artfully arranged to resemble a miniature Christmas tree. Priced at £28, the platter includes 35 pieces of sushi including a mix of vegetarian and seafood options; salmon, tuna, tempura prawns, fresh avocado, cucumber and carrots.